1 May, 2013. Storewide sale on now - get 30-50% off everything while stock lasts. In this edition of our newsletter we announce our biggest sale ever, and we also have a lucky draw competition where someone will win a gift pack of tri gear worth over $200 just by taking part in our first-ever site survey! There are big savings available right now in our online shop with a massive 30-50% discount off our entire stock! This amazing sale is on all stock until sold and with over 200 different product lines, there is definitely a bargain waiting here for you. Take a look in the TriathlonOz shop here right now. Our huge sale is on storewide but here's a list of popular items you may not know we carry. Be quick, these are sure to sell out fast with our big 30-50% sale on now! The latest must-have elastic laces for your running shoes just $4.95 a pair! The total prize value is worth over $200 and will be won by random selection on Thursday 16th May. 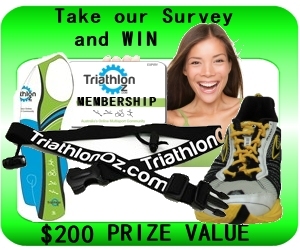 To be in the draw, simply take this link to do our survey. As a registered subscriber this link is personalised to your profile so we can allocate your prize should you be the winner! Good luck, and thanks in advance for your support - we greatly appreciate your time in providing this feedback.